THE CURSED A CINEMA SERIES By Shea Ronsonette The Celtic Demigod CuChulainn still walks among us, suffering a timeless curse. Bound by Honor and Divine Blood, he and his clan use their curses as a weapon, feeding on the blood of evil men and protecting humanity from the monsters that time has forgotten. 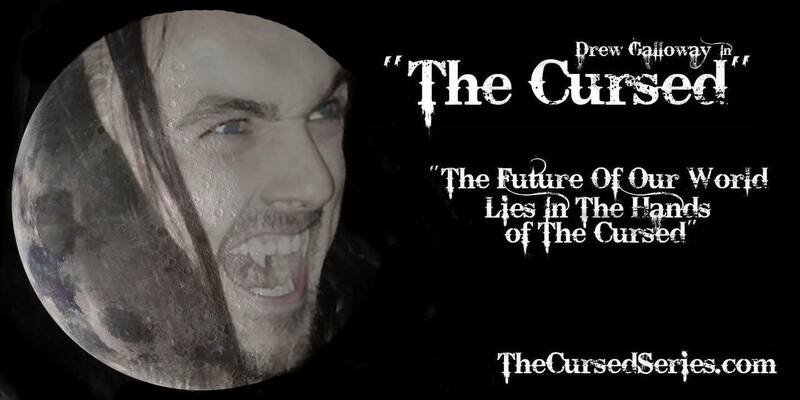 The Cursed is an Independent Horror Series based on the modern day life of a cursed Messianic, CuChulainn. Charged on Holy Order to eradicate the wicked, he and his clan must still feed their varied curses to stay alive. Interspecies breeding between Mythological Creatures, Historical humans, Messianics and gods over the past several millennia, have combined with man’s perversion and greed to create a ripe killing field. Now, at the dawn of what they call “The 13th Apocalypse”, the clan is faced with restoring the balance between good and evil on the earth or watching as humanity is virtually made extinct by the warring gods. In our two-hour long Series Premiere, a viral video of a paparazzi being killed by a zombie like creature on clan property surfaces during the indoctrination of a new member. This causes the age old search for CuChulainn’s Arch Nemesis to be put on hold. Adding to the turmoil, a drunken infidelity in an already rocky relationship, causes him to lose the love of his life to a rival. With his world unraveling around him, he finds solace in the suffering of his victims and revenge upon his rival. Closer than ever to finding the body hopping Ancient Priest who wrought this Curse upon his people, our Dark Hero must face his own Karma, as the only woman he has ever loved has vanished into thin air. Is she in trouble? Or is she actually walking out of his life forever, just when he needs her most? THE CURSED SERIES We are taking Independent Film to a whole new level. We have created a new product in the entertainment industry. The Cursed Series combines both Cinema and VoD distribution for monthly dual releases. This product benefits all parties. It will bring audiences back to the theater each month for a new episode, increasing ticket sales. At the same time, it’s new and established viewers can easily keep up with the series on VoD, with rentals and purchases. This combines the revenue streams for our investors, brings a faster ROI, and increases profitability through built in marketing. Each month, a new 1.5 hour episode of The Cursed will arrive in Independent Cinemas across the globe. When the new episode enters theaters, the previous episode will be released on VoD. For increased marketability, we urge Theaters to play the series each night at matinee pricing. This further establishes us as a new and unique product. Our series begins in modern times with CuChulainn still alive through a curse, placed on him and his family shortly after his birth. In this fresh new genre, we take action, horror, fiction and history to a whole new level. With over 2 millennia of historical material and stories to pull from, and a clean slate for the future, The Cursed uses Magic and Mythology, mixed with real History and Cosmology to paint the dark yet vivid World of CuChulainn. The full two-hour Premiere introduces key characters and establishes the situation our Hero finds himself in at the beginning of Season One. It sets the stage for our first episode, as he continues his almost 2,000 year-old hunt for the Evil Priest who cursed his family. Using both period scenes and modern day sequences, the story of his birth, curse, and life to present is unraveled through the episodes. The epic saga of the constantly changing facets of his curse and its implications are also reflected in his closest family and friends, who are all victims of one or more different curses of their own. Being both real and fantasy, The Cursed will encompass the fan bases of The Walking Dead, Game of Thrones, The Strain, True Blood, The Originals, Super Natural, Grimm and more. With Wrestling Super Star, Scotsman Drew Galloway, playing the role of this Celtic Demigod, his enormous European following and the literally massive fan base of WWE and TNA will be absorbed as well. Bringing aboard Zakk Wylde as both a recurring character and Music Producer brings his fan base of Black Label Society, Ozzy Osbourne, Metallica and more into our target audience. A living immortal Messianic, suffering the curse of Abhartach, CuChulainn unknowingly broke the conditions of the curse and became a Vampyre. This is not to say he became a living dead vampire as shown by Hollywood in children’s stories like Twilight. The Cursed is not a Vampire Dairy for lonely housewives and hormonal adolescents. Such a great Hero as CuChulainn should never be trivialized as such. In his way, he has turned the curse to work for him... stalking the night and eradicating evil, feeding on serial killers and other criminals that manage to escape justice. In the rich and deeply rooted history of this character, he is cited for the disappearance of famous murderers like Jack the Ripper, The Zodiac Killer and more, literally becoming the Wrath of God upon the Earth. When visited by the Archangels, CuChulainn is told that the balance between good and evil is broken. With the scales now tipping toward darkness, Apocalypse approaches. In a race against time and evil, he and those he loves must stop the end of days from coming or watch as humanity is virtually made extinct. After wading through countless distractions from his personal life, he finds that just when he thinks he has a handle on the situation; a new element emerges, throwing him back to the drawing board and one day closer to Armageddon. With all the inherent components of “The Next New Thing”, The Cursed is set to be the first series to merge compelling storylines that incorporate Drama, Mystery and Occult Mythology, Action, Suspense, Horror, Real Historical Events, and Darkly Comical Relief into a non-formulaic and constantly evolving core that’s heavily immersed in Music and deeply psychological content. Our characters face the consequences of their actions and inactions as they wade through the Karmic debris of living for 2 millennia. This allows us to continually create and drive the core of the series in endlessly new directions while maintaining continuity. Often stepping over the line and consistently challenging peoples’ assumptions, The Cursed exudes a vitality that is uncommon among most series today. As the opening season takes us through the Apocalypse, The Cursed has the intrinsic ingredients to surpass the viewership of leading VoD series and Cinema releases in its genre, by maintaining a future that’s wide open to every time period from the crucifixion to the distant future. Each season can start with a clean state to build around the core as episodes evolve. As a Cinema Series, we gather the fan base of feature series like Blade, Underworld and Twilight. Data gathered from more than 85,000 views on our YouTube channels, shows that we have a heavily male based viewership of 63% in 18-45 year olds, with a dense portion of our female viewers being between the ages of 30-50. 50% of our viewers are outside the US. This makes us a force to be reckoned with on the international market as well as a strong investment domestically, considering we are achieving steady growth of over 15,000 views a month without advertising. Averaging 18-25 views per hour, half of our views are generated from the YouTube search engine, indicating how strong “word of mouth” is for our content. The unpublicized launch of our website on March 19th pushed roughly 1,800 new views on our YouTube channel in the span of just a few hours. It is our firm belief, that when The Cursed is advertised in the Cinema and VoD markets, it’s earning potential and longevity will insure the unbridled success of the project and create a viable new product in the Motion Picture Industry. Our goal is to secure funding for the Premiere in August and begin shooting in mid-September. We look forward to a Spring release in Independent Cinemas across the globe. Preproduction of the 12 Monthly Episodes of Season One will begin in October. When Episode Three goes into post production, we will release Episode One. The VoD release of the Premiere will be withheld until 90 days prior to the launch of the first episode, to increase timely exposure. We are convinced that The Cursed will not only be successful, but will generate continued profits that will be sustained by the longevity of its content. It will continually engage more revenue through its marketability to a constantly expanding demographic. We hope you will join us, as we bring The Cursed to life and reintroduce the Greatest Warrior in History to the World, CuChulainn.